In the age of the customer, the next generation customer experience will be powered by artificial intelligence. When everyone and everything is connected to the Internet, companies must leverage information and digital technologies including cloud computing, mobile, social, Internet of Things (IoT) and AI to transform how they connect with customers in a whole new way. Per Gartner, 89% of marketers expect to compete primarily on the basis of customer experience. Customer experience is a top priority and managed as a team sport. Digital business transformation will require an experimental and technology-led mindset that must be inclusive of the entire business - marketing, sales, services, IT, R&D and customer and partner communities. How can companies today leveraging technology to drive digital business transformation? To better understand the state of digital transformation, I spoke with Brian Solis, a world renowned digital business expert regarding his most recent research. Brian Solis (@briansolis) is a digital analyst, anthropologist, and also a futurist at Altimeter, a Prophet company. Solis studies the effects of disruptive technology on business and society. He is an award-winning author and avid keynote speaker who is globally recognized as one of the most prominent thought leaders in digital transformation and innovation. Brian has authored several best-selling books, including What's the Future of Business (WTF), The End of Business as Usual, and Engage!. His latest book, X, explores the intersection of where business meets design to create engaging and meaningful experiences. 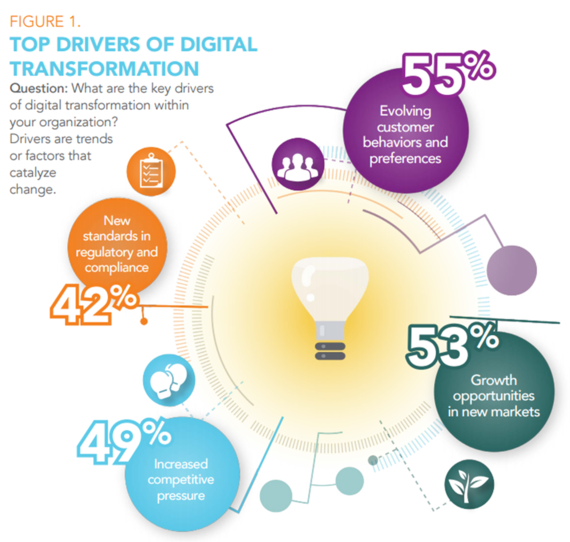 The latest focus by Solis is 'The 2016 State of Digital Transformation' research, designed to learn about how companies are changing and the challenges and opportunities they face while doing so, per Solis. The research is based on input from 500 digital transformation strategists and executives who are digital transformation change agents. The realignment of or investment in new technology, business models, and processes to drive value for customers and employees and more effectively compete in an ever-changing digital economy. Digital transformation is one of hottest trends in business today but the term itself means different things to different people. Many organizations continue to wrestle with balance of technology and organizational priorities to define a collaborative productive path toward change. IT remains influential in driving digital transformation. In 2016, companies are making progress, but customer-centricity still appears to be more about words than actions. Customer experience remains top driver of digital transformation, but only half of the companies have mapped or are mapping the customer journey. Digital transformation is pushing businesses, across departments and functions, to collaborate, innovate, and design new business models and processes. Innovation has become a key priority in digital transformation efforts. 53% of companies cite "growth opportunities in new markets" as a driver to not only reach existing customers in better ways, but also expand markets. 2. 55% of those responsible for digital transformation cite "evolving customer behaviors and preferences" as the primary catalyst for change. Yet, the number one challenge facing executives (71%) is understanding behavior or impact of the new customer. In my opinion, companies must lean into their CRM platform to accelerate transformation and grow market share. This will require investments in smart applications powered by artificial intelligence (machine learning, deep learning, analytics - proactive and prescriptive analytics) and marketing automation technologies that are integrated with services and sales lines-of-business. 3. Leaders struggle to understand new connected customer behaviors. "Companies that don't grasp or internalize the customer journey are obstructed from seeing its potential for optimization and innovation," said Solis. 4. The #1 challenge facing executives (71%) is understanding behavior or impact of the new customer. Yet, only half (54%) of survey respondents have completely mapped out the customer journey. This means that many companies are changing without true customer-centricity. "Another top challenge facing digital transformation is the very thing that governs the course of business: a culture that is pervasively risk-averse (63%). Boards, shareholders, and stakeholders want to make improvements and increase profitability but are often unwilling to examine and change the governance in place today," said Solis. 5. Only half (54%) of survey respondents have completely mapped out the customer journey. This means that many companies are changing without true customer-centricity. Improving operational agility to more rapidly adapt to change (79%). 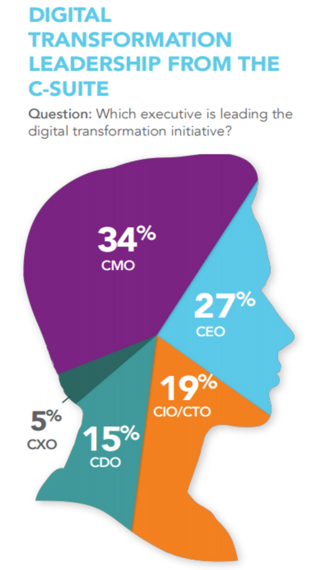 The CMO and CEO continue to lead digital transformation. 7. 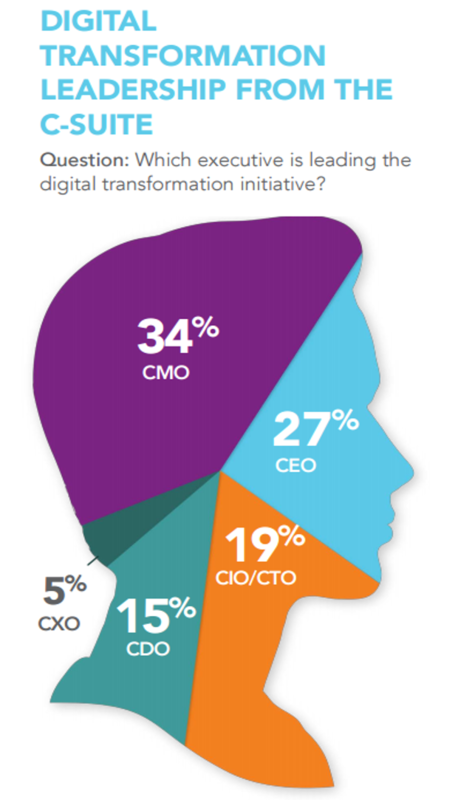 According to the survey, digital transformation is largely led by the CMO (34%). Not far behind, though, is a digitally savvy generation of CEOs who, at 27%, recognize that it's time to lead their companies into the 21st century, according to Solis. Which departments are digital transformation change agents? 8. Digital departments are now very common, with 81% of companies citing their existence. Yet, only 40% have a formalized cross-functional workgroup. These digitally focused groups tend to employ four to five full-time employees. 9. 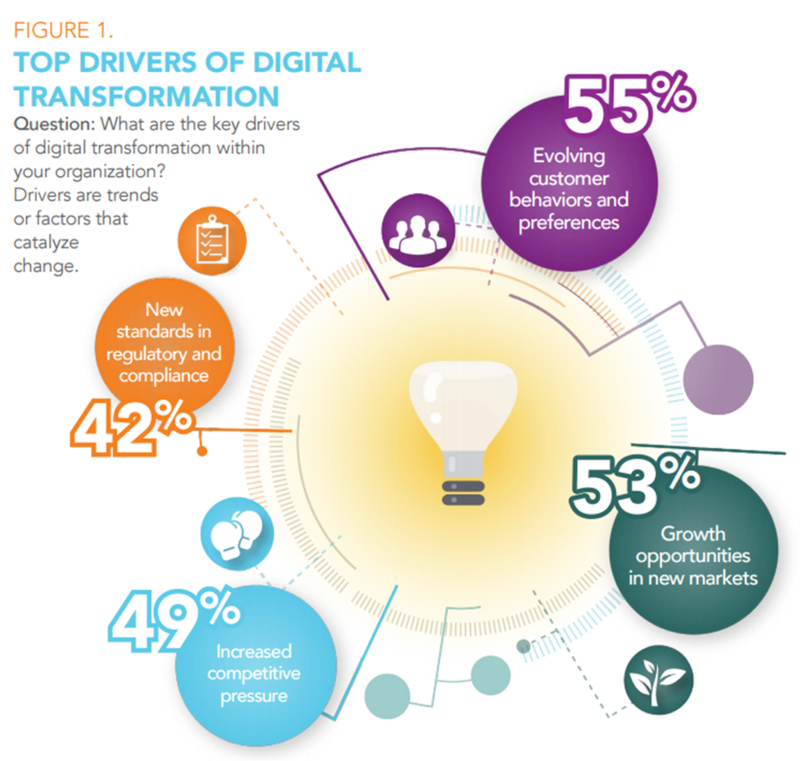 Innovation tops digital transformation initiatives at companies today. 81% said it was at the top of their agenda, 46% stated their company has launched a formal "innovation center." Right behind innovation was modernizing IT infrastructure (80%) and improving operational agility (79%). 10. Disrupt or die? 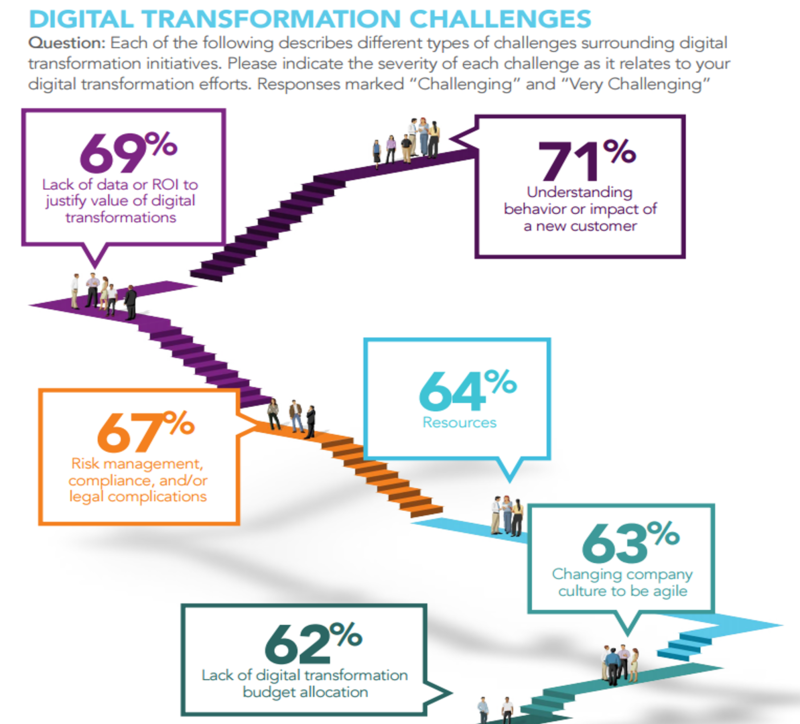 Despite all the lip service it gets, only 19% cited "fear of disruption" as a major reason for digital transformation efforts. 11. Mobile is still not getting enough respect. A mere 20% of leaders surveyed are studying the mobile customer journey/behavior. "Mobile is just the beginning of disruption in the customer journey. With the runway for disruptive technologies still ahead (e.g., wearables, Internet of Things (IoT), artificial intelligence, virtual and augmented reality), companies will need a resilient infrastructure that adapts to not only mobile's "micro-moments," but also the impact of all these trends and new devices over time," said Solis. 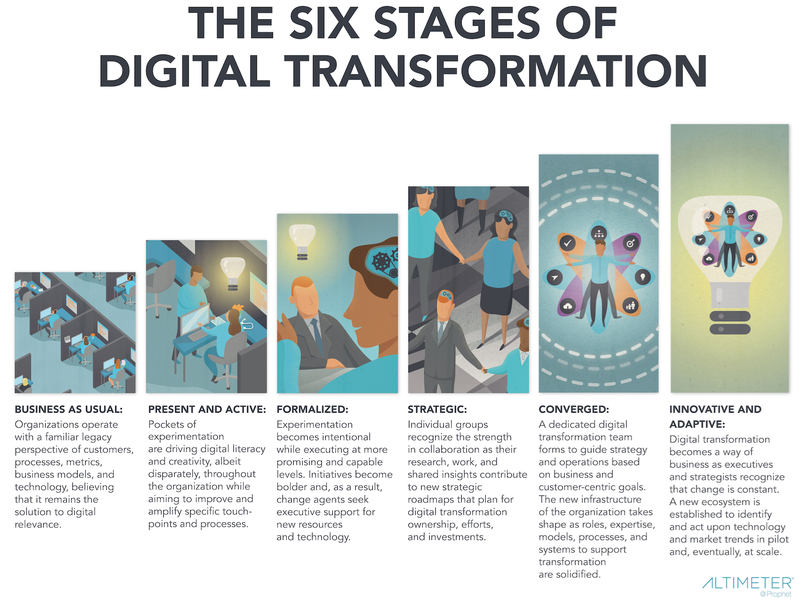 A good reference for to better understand the six stages of digital transformation and how mature companies implement emerging technologies. 12. More data, less understanding. 71% of leaders said understanding behavior of connected customers is a top challenge they face. Despite more data being available, this number has increased from 2014, when only 53% cited familiarity with this challenge. 13. There is ROI in digital transformation. 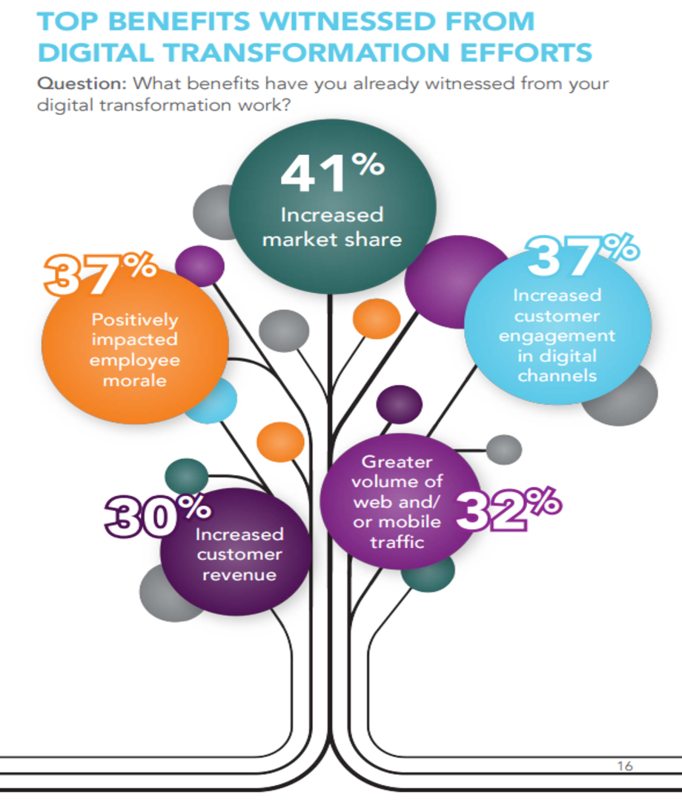 41% of leaders surveyed said they've witnessed an increase in market share due to digital transformation efforts, and 37% cite a positive impact on employee morale (37%). "Existing KPIs help validate early work in digital transformation. But often, measurement efforts are focused on measuring isolated efforts within each department/function. For example, only 22% of those surveyed cited having a content strategy in place that addresses customer needs at all journey stages, but content analytics are in the top five most important metrics measured. 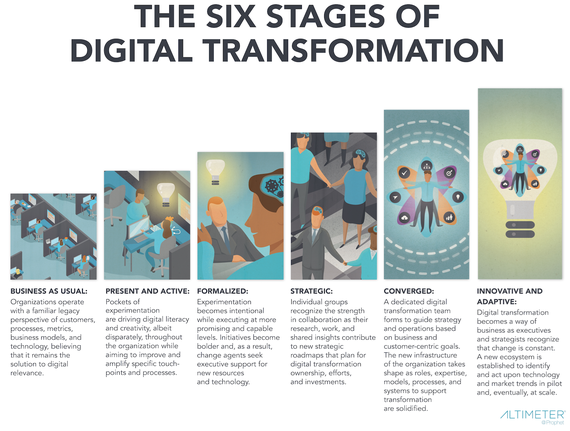 There is disconnect between strategy and measurement in digital transformation efforts," said Solis. 14. Digital transformation appears to be driven by short-term plans: Just 29% of companies have a multi-year roadmap to guide to digital transformation evolution. 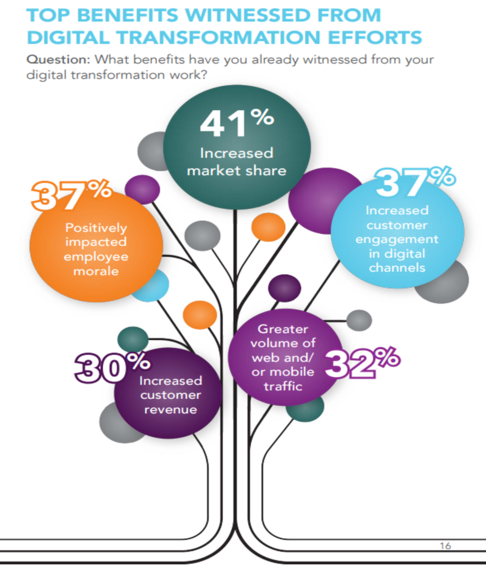 What are the top benefits of digital transformation? "Digital Darwinism favors those companies that invest in change," said Solis. 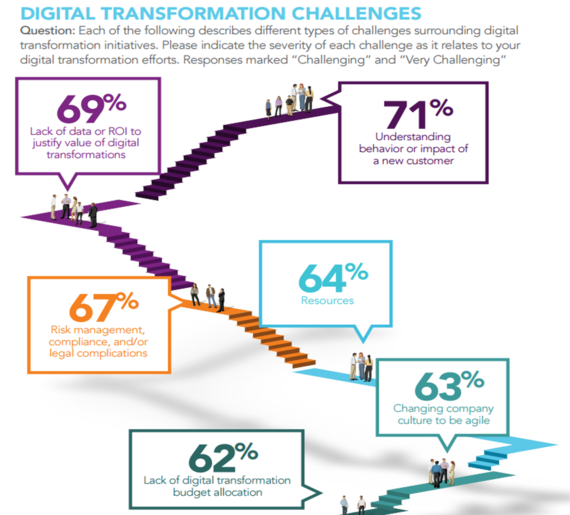 "Digital transformation isn't easy though. Its true evolution takes time and resources, with benefits delivered in the longterm. This, to some, can represent deliberate moves away from delivering against quarterly returns. That's the paradox of investing in digital transformation; it gives returns to those who treat it as a long-term investment versus those who expect immediate impact," said Solis. increased market share (41%) and increased customer revenue (30%). Additionally, the ROI of digital transformation is reflected in employee morale. In that regard, 37% of respondents stated that second to increased market share, employee engagement was the next big return. 16. Digital transformation required multi-disciplinary involvement - To accelerate innovation, 46% of those surveyed stated that their company has launched a formal "innovation center" to understand and test new technologies and develop new solutions/services. 17. More advanced companies combat disruption and expand innovation by partnering with startups, investors, entrepreneurs, and universities to accelerate use and adoption of emerging technologies. 18. 51% of businesses partner with the startup ecosystem, 28% focus on product innovation and or concept development and 13% hope to enhance CX as a result of their innovation center. "Digital transformation is as much a technology story as it is one about how people lead change inside and outside the company. The human factor is pervasive in each of our reports on the subject. It's really the driving force behind evolution and revolution in business," said Solis. I subscribe to a simple definition of digital per Accenture: Digital is the application of information and technology to bolster human performance. How is your company using information and technology to bolster the performance of your stakeholders - employees, partners, customers and the communities that you serve?